EDGEBROOK — Kara Cobb Johnson, one of the driving forces behind a push to turn a graffiti-covered eyesore into a mixed-media mural that pays homage to the area's history, will discuss her work as part of Chicago Artists Month. Johnson, who was so appalled by the condition of the underpass while pushing her baby daughter in a stroller near her Edgebrook home that she helped launched the years-long effort to turn it into a landmark, will speak from 7 p.m. to 8 p.m. Oct. 25. "It is an ongoing project that continues to inspire me," Johnson said. 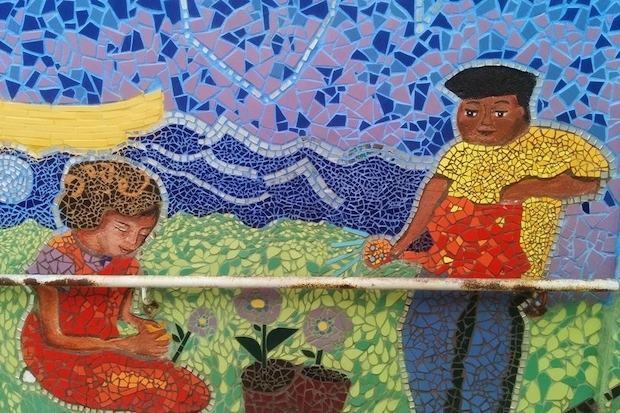 The Neighborhood Connection Project mural, at Le High, Kinuza and Hiawatha avenues, features not only painted images but also mosaic, sculpture and photographs using a French art technique known as bricolage to craft a three-dimensional covering. One portion of the mural will depict the 1943 opening of the underpass, which connects the Edgebrook, Wildwood and North Edgebrook communities. The tunnel — which is no more than 5-feet wide — allows residents to cross the train tracks and avoid busy Devon Avenue. Other portions of the mural honor the area's earliest settlers, members of the Potawatomi tribe of Native Americans, as well as the area's lush vegetation and fertile land. The Hiawatha Express train once traveled the tracks above the underpass, and the mural includes a portrait of the train in motion, with the Chicago skyline in the background. Much of the mural was done by teens supervised by Johnson and other artists from the community and Green Star Movement, a nonprofit organization that has worked with schools and neighborhoods to create public art projects throughout the city, that partnered with After School Matters to pay the teens. The third and final phase of the mural along the eastern side of the underpass is scheduled for summer 2015.